VAUGHAN, ON – Lake Wilcox Brewing has announced that it has been named an official sponsor of the Toronto Rock, six-time champions of the National Lacrosse League (NLL). 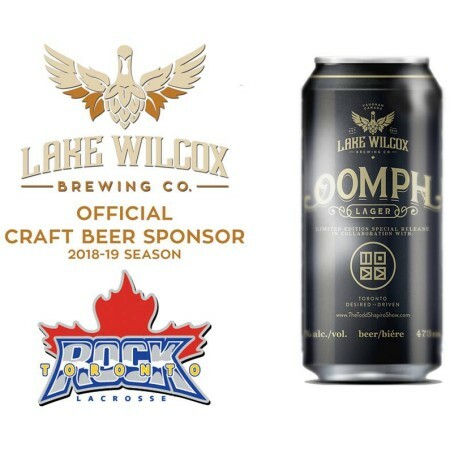 As part of the partnership, Lake Wilcox’s Oomph Lager (5% abv) – released in partnership with the Todd Shapiro Show on SiriusXM, and described as “an easy drinking blond lager that is dry hopped and partially filtered” – is being called the Official Beer of the team for the 2018-19 season. While Lake Wilcox beers will not served at Rock home games in Toronto’s Scotiabank Arena due to a contract between the venue and Molson Coors, all away games will be screened in the brewery taproom at 1033 Edgeley Blvd. in Vaughan, where Oomph Lager and other Lake Wilcox brands are always available.